Ilima-Lei Macfarlane stopped by Bellator 219 to talk about her fight with Veta Arteaga, walkouts, fighting in San Jose and more. Temecula, CA — You can’t always fight at home, and Bellator’s Ilima-Lei Macfarlane understands that. Which is why she has no problem defending her women’s flyweight title in San Jose, rather than holding out for a second fight in Hawaii. Of course, Macfarlane headlined Bellator: Hawaii in December, picking up the biggest win of her career to date against Valerie Letourneau. 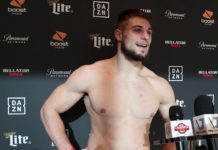 But there’s no letdown following up Bellator Hawaii with a fight in California, Ilima-Lei told media outlets backstage at Bellator 219 over the weekend. 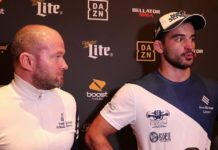 “Obviously, Bellator Hawaii was beyond my wildest dreams, it was the perfect fairy tale story and everything. But San Jose is a completely different fight, a different scene, a different walkout — of course my walkout’s going to be bomb.” Spoiler: the theme of her next walkout will be water, and Hawaiian waves. As Macfarlane has moved from prospect to star for Bellator, she’s been more and more in the spotlight, recruited for ads, and other projects outside MMA. But the coolest part of the experience, for the champ, has been sharing her personal life. 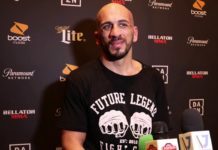 Watch the full press scrum with Ilima-Lei Macfarlane, backstage at Bellator 219, above!